The potential societal gains of rapidly developing technologies such as AI are expected to be many. However, the actual impact of AI on jobs, for instance, is uncertain. In his keynote address, Andrew Keen, author of The Internet is Not the Answer, and How to Fix the Future, referenced a 2013 Oxford University study predicting that over 50% of jobs may be lost over the next twenty years because of AI. While new jobs will likely be created, the rate of technological change could leave many without work, which could deepen the technological divide. To mitigate risks and to attempt to distribute the benefits of rapid technological change, the UN has formed the Technology Facilitation Mechanism, of which the STI Forum is a part. The aim of the TFM is to facilitate multi-stakeholder collaboration and partnership to direct STI advancements toward SDG achievement. Initially proposed at Rio+20 in 2012, the TFM pursues the mandate to map existing technology facilitation initiatives, identify areas of synergy and potential cooperation, develop an online information-sharing platform on STI, and cooperate with relevant stakeholders on STI capacity building. Thomas Philbeck, head of science and technology studies at the World Economic Forum, suggested that instead of focusing only on policy recommendations, we need to change thinking about rapid STI advancements. He argued that thinking about these advancements in a positive way will be essential toward realizing the great social promise of these new technologies. Relatedly, ICANN’S Marby raised the concern that policy efforts to over-regulate emerging technology could constrain the potential social benefits of these technologies, as has been seen with over-regulation of the internet. Throughout the discussions on rapid technological change at the 2018 STI Forum, one view was made perfectly clear: multi-stakeholder cooperation is needed to break silos and develop sustainable multi-stakeholder solutions to mitigate technological risks and maximize benefits toward SDG achievement. 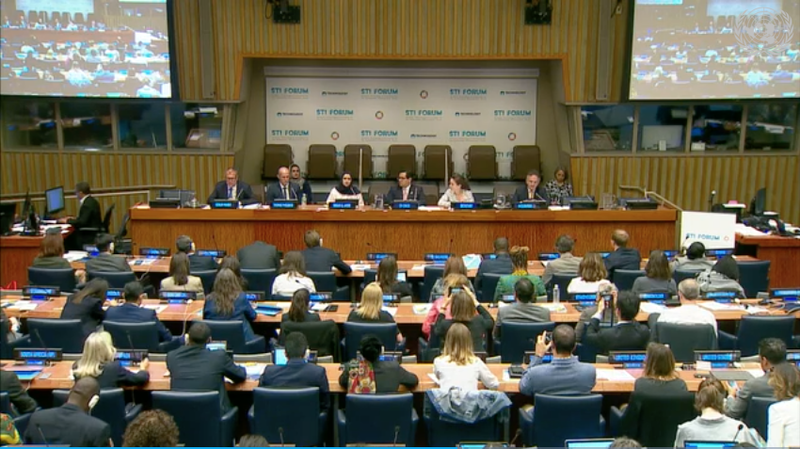 "Opportunities, Risks Of Rapid Technological Change Discussed At UN" by Intellectual Property Watch is licensed under a Creative Commons Attribution-NonCommercial-ShareAlike 4.0 International License.